Dental Fillings or Dental Restoration are a common and widely used treatment in modern dentistry. 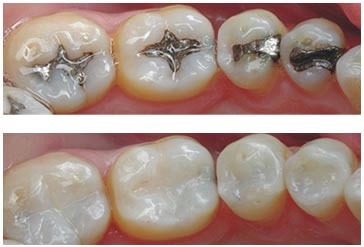 Dental fillings are typically made of dental amalgam, a metallic compound containing mercury that has been used for fillings for many decades. Fillings made of this amalgam are of a metallic hue and can give a grey tinge to the tooth. i.e., Dental fillings are among the most common dental procedures and include fillings, inlays and onlays, veneers, implants, crowns, bridges, and dentures. They are used to restore damaged, decayed or missing teeth. They can also relieve associated dental pain. They can frequently save teeth that would otherwise need to be extracted. *) Direct restorations: This technique involves placing a soft or malleable filling into the prepared tooth and building up the tooth before the material sets hard. *) Indirect restorations: This technique of fabricating the restoration outside of the mouth using the dental impressions of the prepared tooth. All dental restorations can be further classified by their location and size. A root canal filling is a restorative technique used to fill the space where the dental pulp normally resides. The prepared tooth, ready for placement of restorative materials, is generally called a tooth preparation. Materials used may be gold, amalgam, dental composites, resin-reinforced glass ionomers, porcelain or any number of other materials. In India the cost for Dental Fillings starts around $250 which is very cheap compared to other countries like US and UK where the price starts around $850.